Our 3-in-1 inflatable will have your guests lined up to see who can win the biggest prize of the day!!!! 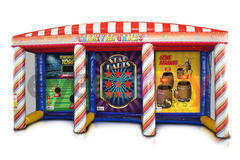 This inflatable carnival game includes three different games touchdown toss, star darts, and gone bananas monkey in a barrel. This inflatable will provide an exciting edge to your next party or event and leave your guest smiling as they can't wait to get back in line and try their luck again and again!